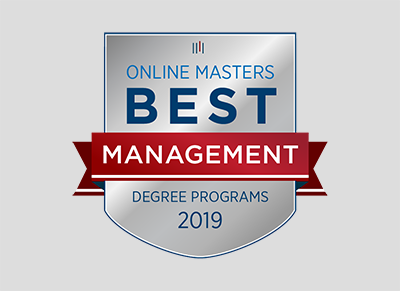 Indiana Tech’s Master of Science in Management has been named a Best Online Master’s in Management program for 2019 by OnlineMasters.com. OnlineMasters.com is a source for college rankings and higher education planning that bases its research on curriculum quality, program flexibility, affordability and graduate outcomes. In addition to using insights gained from industry professionals, OnlineMasters.com leveraged an exclusive data set comprised of interviews and surveys from current students and alumni. Each online degree program was analyzed with only 47 making it to the final list. The methodology incorporates the most recent data from the Integrated Postsecondary Education Data System (IPEDS) and statistical data from the National Center for Education Statistics. Most importantly, only programs from accredited nonprofit institutions were eligible. Students who pursue a master’s in management can also gain employment as a marketing director, director of operations or human resources director. The steady job growth in this market is just one of the many reasons OnlineMasters.com researched, analyzed and ranked the top master’s in management programs. To access the complete ranking, visit onlinemasters.com/best-degree-programs/management. Learn more about Indiana Tech’s Master of Science in Management program here.